The World Pie Eating Championships were thrown into turmoil when it emerged that a work experience chef sent the wrong pies to the event. Organisers said the snacks - double the correct size for the contest - should have gone to a divorce party but were sent to Harry's Bar in Wigan in error. 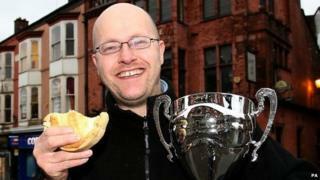 Ex-champion Barry Rigby, 37, of Wigan, a fitness instructor, set the best time of 42.6 seconds for eating half a pie. But umpires declared the results null and void because of safety concerns. They said eating the 24cm (10in) pies could result in a dangerous "swallow stall". Tony Callaghan, owner of Harry's Bar, said: "The work experience lad was tasked with providing 24 competition pies but mixed up the order and sent them to a divorce party up the road. "By the time we realised, it was too late." Mr Callaghan said: "We had to go ahead. "It was a bit like Andy Murray replacing Roger Federer for a show game at the tennis finals in the O2, but everyone took it in their stride and demonstrated the professionalism of pie eating at this level. "It was a shame because these lads practise long and often: you can see how seriously they take it, practising pie-eating late into the night on every street corner in Wigan town centre." The cooked dimensions of the official competition pie should be a diameter of 12cm (5in) and a depth of 3.5cm (1.5in). The competition regulations also state the content of the meat and potato mix have to be 1cm (0.4in) and they must have 66% meat content not including pastry.